Our astronomers meet on the third Friday of the month for Astro Cafe: This month (19 April) it is at 6:30 PM at Tim Hortons in Sechelt. If the skies are clear after we have coffee and discussion, we take our telescopes down to the seawall in Davis Bay for public viewing. The forecast is looking promising at present. There is a full Moon which will interfere with deep sky viewing. Everyone welcome! We’re asking for members to meet at the Sunshine Coast Arts Centre, 5714 Medusa St., Sechelt, at 7 PM on 12 October for a brief AGM at which we will be voting for the new executive. At 7:30 PM, the Sunshine Coast Centre of the RASC presents two speakers. The first is Dr. Chris Gainor, a historian specializing in the history of space flight and aeronautics. He has five published books. He is also President of the Royal Astronomical Society of Canada, and editor of Quest: The History of Spaceflight Quarterly. Chris’ topic will be: History of the Hubble Space Telescope. The Hubble Space Telescope was launched 28 years ago in 1990. After overcoming problems caused by a defective main mirror, Hubble has made discoveries that have revolutionized our view of the universe we live in. This talk will cover the history of HST based on a history book the speaker is writing for NASA. The second speaker is Sarah Savić Kallesøe, a Simon Fraser University undergraduate student involved with the research and public outreach affairs of the Trottier Observatory since its inception in 2015. As the first student with training and access to the observatory, Sarah has led imaging projects, astronomy workshops, and data collection sessions. In 2017, Sarah was invited to conduct research with the graduate student observational astrophysics group at the Niels Bohr Physics Institute, University of Copenhagen, where she was the youngest member and the only Canadian accepted. Her research was conducted at the Nordic Optical Telescope in La Palma of the Spanish Canary Islands and focused on quasar identification and classification of novel supernovae. The results of this project were published in the Astronomer’s Telegram and included in the NASA Astrophysics Database. Sarah will graduate from SFU with a First Class Distinction Bachelor’s of Science in Population and Quantitative Health Sciences in June 2019. She is the 2019 BC Rhodes Scholar nominee for SFU and her career aspiration is to contribute to the World Health Organization’s research relating to the well-being of migrants and their access to health care services. While her formal undergraduate education in public health does not directly relate to astronomy, she appreciates the complexity of both systems. Beyond academia and astronomy, Sarah thoroughly enjoys exploring BC’s nature her Scout group. Admission is free: donations gratefully accepted at the door. Join us at the Botanical Garden on September 2nd for the very popular Harvest Festival, this is usually one of our best attended events. This will be the last outreach event for the club this year and we will have our solar observing telescopes out in force. Lets hope for some clear, smoke free skies. 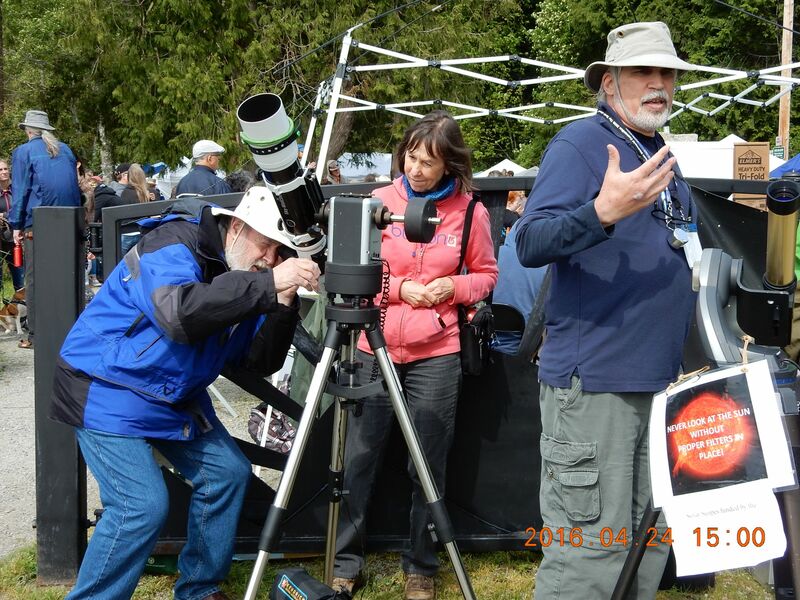 After a two-year absence, the Sunshine Coast Centre of the RASC is bringing the popular Astronomy in the Park program back to Porpoise Bay Provincial Park in Sechelt on Saturday, 11 August from 1 to 11:30 p.m. There will be club telescopes, an information booth with membership information, displays and astronomy related giveaways. The first “star” of the day will be the sun, and with the club’s safe solar telescopes, participants will be able to look for fiery prominences and sun-spots. Club members will be on hand with telescopes all afternoon and into the night to answer questions and show off the wonders of our universe. Bill Burnyeat, formerly of the MacMillan Planetarium, will be doing a presentation in the park amphitheatre at dusk. Afterwards our astronomers will have their telescopes in the park picnic area for viewing Venus, Jupiter, Saturn, Mars and countless other celestial objects while overhead the Perseid meteor shower takes place. With clear skies and a new moon, participants should be able to see constellations, star clusters and nebulae. It’s the best show on earth and it’s absolutely free. Remember to bring a flashlight with a red light to preserve night vision. NOTE: Our observatory will not be open on this evening as all of our volunteers will be committed at this event. From July 12 to August 12 the Gibsons Public Art Gallery will be presenting a collection of photos, Heavenly Wonders- Astrophotography by Erwin Diener. We invite you to be moved and challenged by the profound beauty and vastness of cosmic space while reflecting on the human experience. This meet and greet event is scheduled for Saturday July 21, 1 pm – 4 pm. 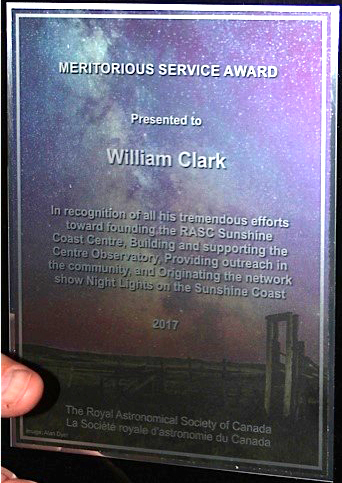 Members of the Sunshine Coast Centre will be present to interpret the photos and show the public views of the sky with telescopes. At 7:30 PM, 9 March 2018, at the Sunshine Coast Art Centre, 5714 Medusa St., Sechelt, the Sunshine Coast Centre of the RASC presents Vancouver Centre President Leigh Cummings, who will be doing a presentation on Mars Exploration. 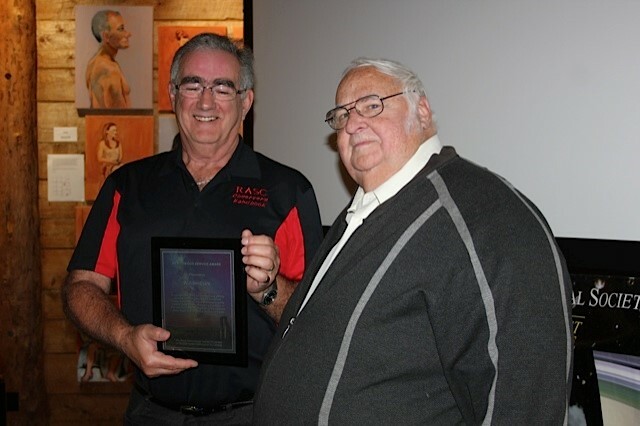 Service Award for Bill Clark!